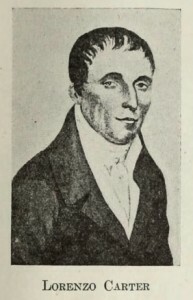 Lorenzo Carter was a Connecticut native who became the first permanent settler of the community that became Cleveland, Ohio. His movement west in the late 18th century typified the experience of many Connecticut residents who left New England in search of adventure and the opportunities that awaited them along the frontier. Carter was born in Warren, Connecticut, in 1766. His father, a Continental army soldier, died when Lorenzo was 11, forcing Carter to take responsibility for his mother and siblings at a young age. Consequently, Carter received limited formal education before embarking on a career as a farmer. Unsatisfied with tilling the soil, however, Carter longed to join an increasing wave of New Englanders headed west to the territories of Ohio. In the late 18th century, Connecticut entrepreneurs embarked on a quest to settle areas in the modern state of Ohio. It was land granted to Connecticut in its colonial charter and sold in 1795 to the Connecticut Land Company, which looked to survey and develop it. 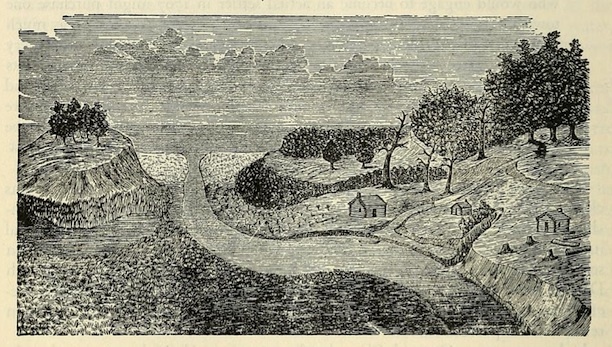 In 1796, a surveying party headed by Augustus Porter of Salisbury headed out to the territory known as “New Connecticut,” or Connecticut’s “Western Reserve,” and surveyed the area around the mouth of the Cuyahoga River. That same year, Lorenzo Carter and his brother-in-law, Ezekiel Hawley, took their families and headed west. They reached Lake Erie, headed north to Canada in the winter, and settled in Cleveland the following spring. Carter built a log cabin under the shadow of a high sandbank near the Cuyahoga River. While many who arrived there chose to settle on higher ground, away from the swampy conditions, Carter remained riverside, establishing a ferry service and a small trade operation with local Natives. In 1801, Carter received a license to keep a tavern, and the following year, purchased 23 ½ acres of land where he ultimately built the first frame house and then the first log warehouse in Cleveland in 1810. In addition to an entrepreneurial spirit that saw him sell hunting supplies, operate a hotel, and build a 30-ton wooden ship for trade on the Great Lakes, he served as the area’s early law enforcement presence and received a commission as a major in the local militia. Lorenzo Carter died in 1814 after a long and painful battle with cancer. Today, he remains buried in the Erie Street Cemetery in Cleveland. Avery, Elroy McKendree. “In New Connecticut.” In A History of Cleveland and Its Environs; the Heart of New Connecticut. Chicago; New York: Lewis Publishing Company, 1918. Link.